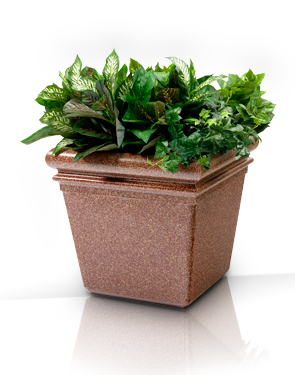 This attractive planter with it's upscale contemporary look will enhance any	indoor or outdoor environment. Engineered from a polymer concrete	formula, this planter is both strong and durable and will withstand extreme	climate changes. This model has predrilled drainage holes with plugs to	ensure proper drainage for low maintenance. High strength-to-weight ratio; long term durability with minimal maintenance. Able to withstand hot and cold climates. Resistant to acids, alkalis, salts, chemicals and solvents.